As you can see, it shows an awful lot more of the game than we saw previously. There are villages, NPC species/races like Gorons and Zora. New enemies and bosses are shown. And much more besides. However, those are only some of the obvious things! 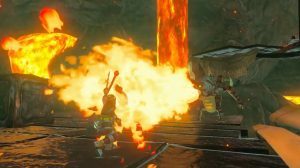 Yeah the Gorons appear here, but did you know the Gerudo make an appearance too? That at least one character has a connection to the Fierce Deity from Majora’s Mask? Or that the Deku Tree may make an appearance? If not, then step right up, and find out more about these cool details from the new trailer! Such as the Molgera like sandworm in the desert area. Looks pretty similar to the Wind Waker boss, doesn’t it? And that’s not all, it also fights pretty similarly too. You’ve got smaller creatures attacking Link around it, like the Molgera spawn from The Wind Waker. 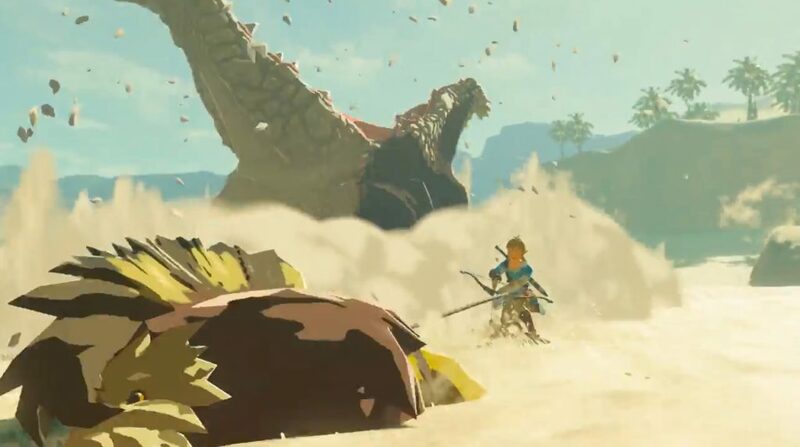 The creatures jaws open in that really wide style that make it seems like he tries to eat Link from underground. And heck, the character even seems to be flying through the air when he exits the sand! Like say, both Molgera and the Twinmold from Majora’s Mask! So yeah, I guess this guy might be throwback to earlier Zelda titles, and appear as a dungeon boss at some point in the story. But while it’s clear that guy is a boss, the darkness in the picture is a little less easy to decipher. It looks like glowing Dark Matter (from the Super Mario Galaxy series) in Calamity Ganon’s colour scheme. Or in other words, a physical embodiment of his evil encountered as an obstacle in the overworld or something. And that’s not all that’s interesting in the picture. Oh no, look at that rock formation a bit more carefully. Looks an awful lot like a dragon type creature, doesn’t it? Or perhaps more accurately, the skeletal remains of a dragon type creature. So perhaps Ganon’s evil essence might be heading to revive the critter, with Link having to get there quick before things take a turn for the worse. Or maybe I’m just overthinking this. It’s pretty hard to tell. What’s a tad less hard to tell though is quite what’s going on in the background of scenes. That’s because they seem to show something we’ve never seen before in Breath of the Wild. Namely, the actual dungeons you explore throughout the story. Think about it. You’ve got a giant ominous lava cave with twisted platforms and metal floors, which doesn’t any location we’ve seen as of yet. There’s a tomb like room with a Sheikah Warrior (which gives Ancient Cistern vibes). And there are two enemies which seem a little tougher than the ones you see on the overworld. Aka the Dinolfos and the Sheikah Warrior. That gives me the impression that they’re found in the ‘proper’ dungeons’. Like how in Zelda 1 and 2, the monsters in the underworld were much stronger than those on the overworld. So it seems like we now have a few glimpses at the actual dungeons in this trailer too. Yeah, it looks a lot like the Mask of Truth from Ocarina of Time. It’s got the Sheikah Symbol prominently visible and looks very close to the Gossip Stones you see throughout that adventure. So is this guy an artificial construct by the Sheikah? Perhaps some sort of golem or something? I’m going to say yes here. He looks like a Sheikah built Iron Knuckle equivalent, so that’s what I’m going to assume he is for the time being. And it’s not just the warrior himself who’s the interesting one. Oh no, look at those glowing swords he’s fighting with. Don’t they look familiar to you? I’m sure they do. Because as any Zelda fan knows, their shape is identical to that of the Double Helix Sword that Fierce Deity Link uses in Majora’s Mask. Which makes me wonder: is this perhaps what the Fierce Deity’s tribe looked like when alive? Or do the Sheikah have some connection to the ancient tribe that created the mask? Either way, it seems like we could be seeing some interesting Majora’s Mask ties in this game’s lore. Still, onto something a bit less ‘important’ now. Do you see this skull shaped rock here? It looks very similar to one we’ve seen earlier, doesn’t it? 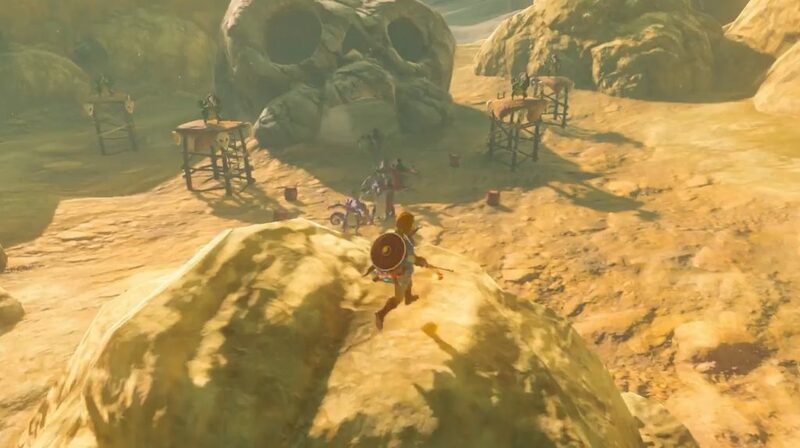 Yep, that’s because it’s the same design as another skull shaped rock in the E3 demo. That one acted like a sort of enemy base, where you’d get some rare equipment by defeating enemies in the cave there. So what’s it doing here too? 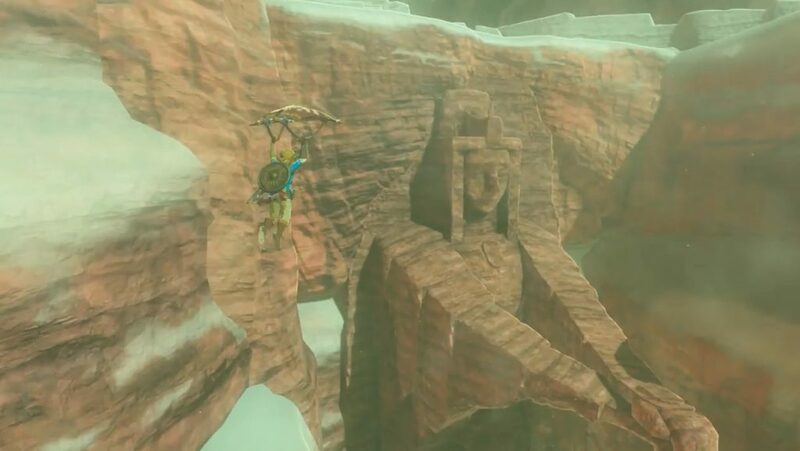 Why is this one identical landmark found in two separate places in Breath of the Wild? Well, that’s a good question actually. Maybe it’s the design for Bokoblin hideouts in the game? Perhaps it replaces the sea towers from The Wind Waker (or the submarines from the same game)? Or maybe it connects to the storyline somehow. 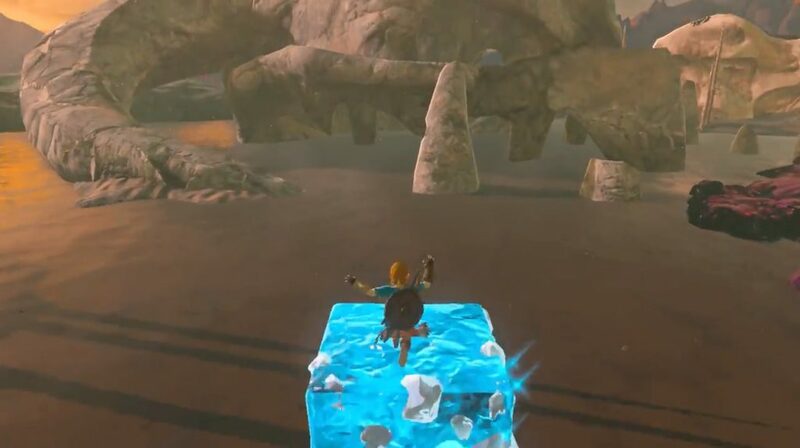 And like in the Wind Waker’s Triforce Quest, it ties into a late game collectathon quest that has you finding a secret stored in these places. Guess we’ll have to wait to find out! 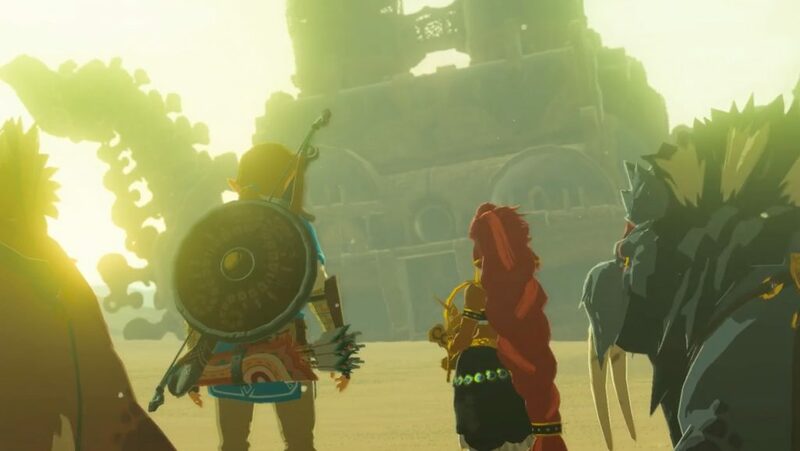 Another neat thing about the trailer is in the scene with the Calamity Ganon and Hyrule Castle. Note the pillars there. Or more precisely, how this time they seem to be lit up with the same malevolent looking glow as Calamity Ganon itself, as well as the darkness in the earlier item on the list. 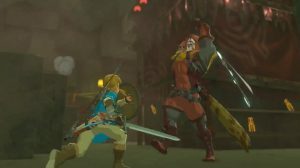 This seems to ‘confirm’ the old theory that the pillars around the castle aren’t just for show, but actually do something to restrain Ganon’s power. Kind of like how the Spirit Tracks work in the DS Zelda game of the same name. 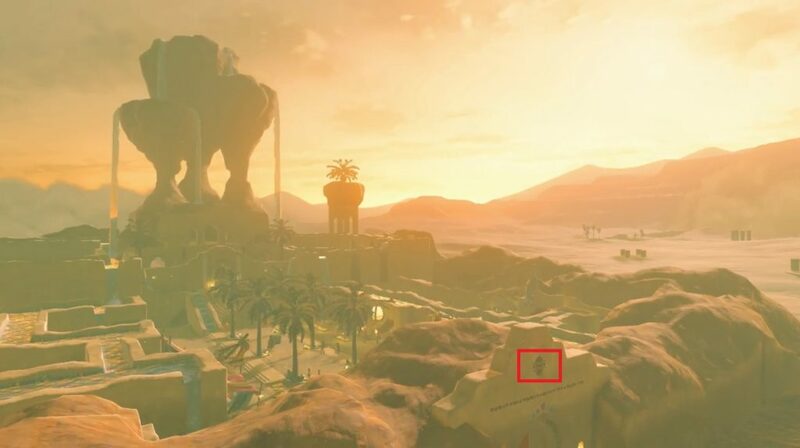 We also see evidence the Gerudo are in Breath of the Wild too. 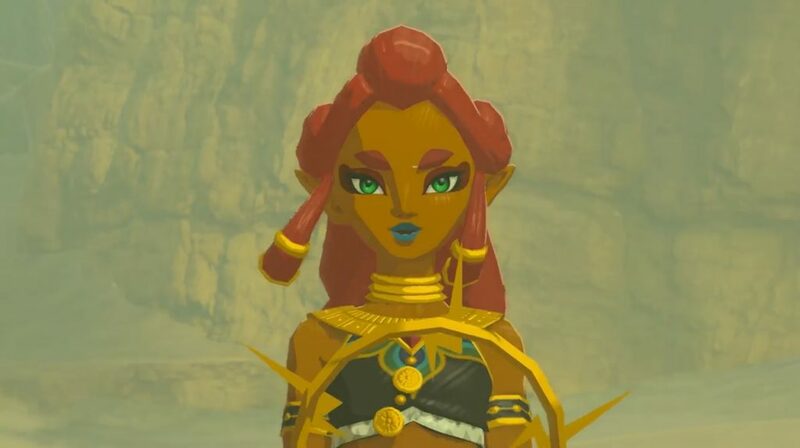 Well, I wasn’t just referring to this Gerudo character. Oh no, look closely at the desert ‘oasis’ type area earlier in the trailer. Or more precisely, the door at the start. 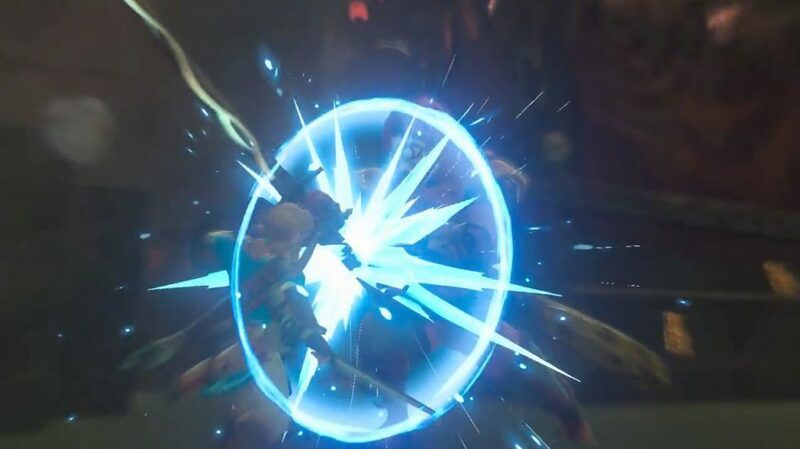 You’ll see the Gerudo symbol clearly visible there and then. So not only are they in this game, but this area seems to be their headquarters. And well, based on the water and fancy architecture, it’s actually quite a nice looking area too. So that also implies the game is perhaps set before Ocarina of Time and other such games. Before Ganon’s ‘land’ became a lifeless desert. Perhaps the war in this game is what screwed the area up to begin with. Maybe Ganon’s evil actions in Breath of the Wild are why he’s so depressed in the finale to the Wind Waker. Or perhaps it’s all just a coincidence. Eh, I’m going with the former. 2. Another Glimpse of a Desert Dungeon? 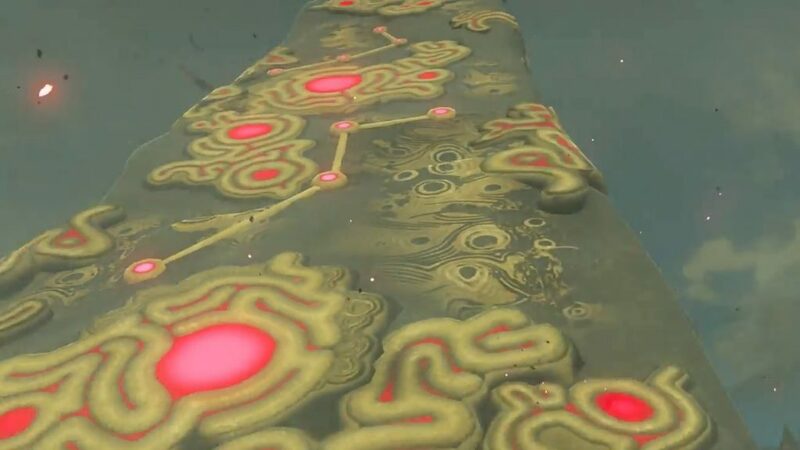 Additionally, the desert also seems to be the location of at least one major dungeon in the Legend of Zelda Breath of the Wild. After all, what else could this mysterious building with the metal towers nearby be? There’s a cutscene nearby, with Link and multiple friendly NPCs in the vicinity. It’s large enough to cover multiple floors with what looks like areas to explore inside and out. And hey, just about everything here screams ‘this area is plot important’. So it seems that’s one dungeon location in the game. Yeah, that Sphinx statue is again, way too big and suspicious looking not to be plot relevant here. Hence I suspect it too hides a dungeon entrance of some sort. Presumably the mountain area dungeon to go with the desert one? I guess so. But where are the other two dungeons the game is likely to have? Well, maybe this location from the trailer may give a hint there. 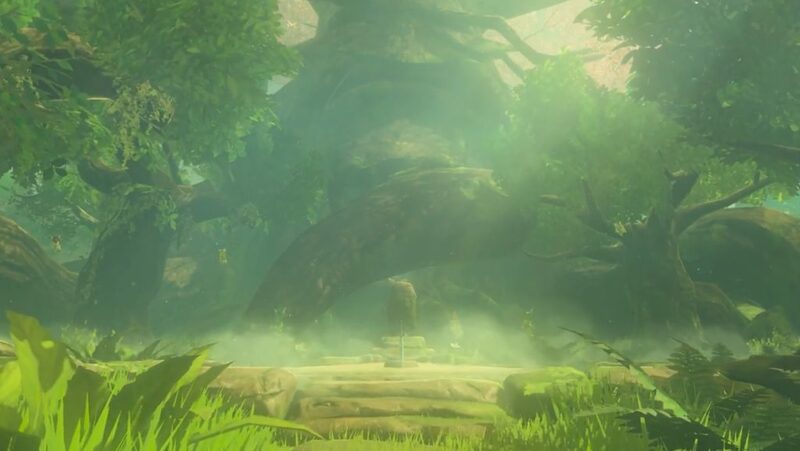 That’s because as you can see, it seems to be the base of the operations for the Koroks across the Hyrule in Breath of the Wild. And you know what that usually means, right? Yep. It usually means the Deku Tree is round the corner somewhere. In fact, it seems to be right here! Can you see it? Yep, that seems to be the same Deku Tree design from Ocarina of Time, just rendered a fair bit more realistically and in less detail. What’s more, it seems the video narration could well be from him as well! So yeah, another old favourite from Ocarina of Time returns in Breath of the Wild. 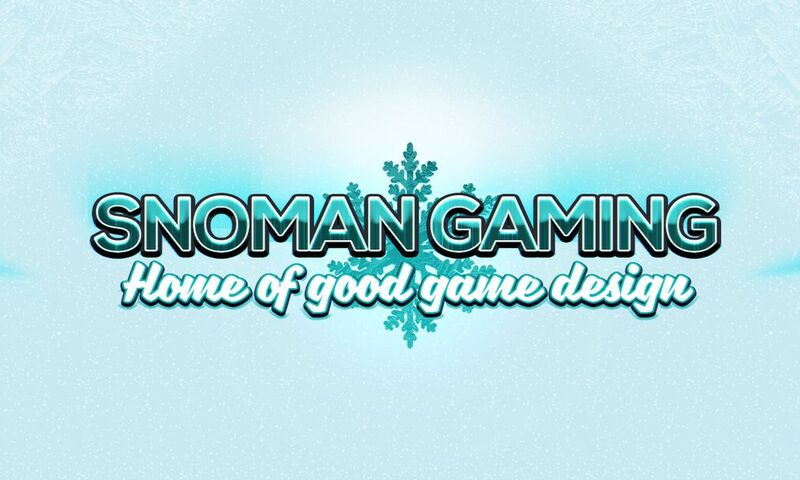 Neat eh?